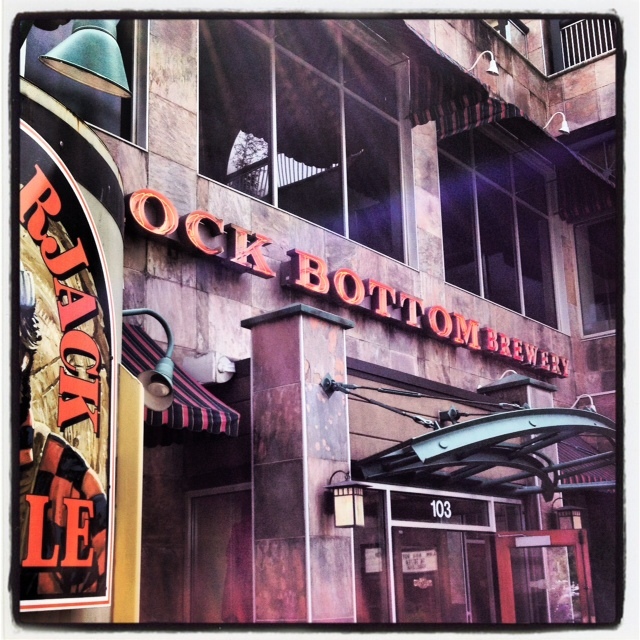 Having just recently been to the Rock Bottom Minneapolis, it was interesting to try out the RB in Seattle. The first time I was here was Thursday morning for the final NHC pre-conference event: A beer breakfast to kick off the official NHC festivities. A large line of folks started outside and just when we started to get pretty hungry they opened the doors, allowing a hundred famished homebrewers into the cozy interior. I barged my way to the forefront and loaded my plate with eggs, fruit several types of sausage and crispy bacon. These guys know how to cater an event! The servers brought several taster glasses of beers throughout the event, including a very good kolsch, and a light honey summer ale. The basic four beers, (kolsch, Belgian wit, red ale, IPA,) are all the same recipe as at the Minnesota Rock Bottom, but the seasonals are different. I was back here a few days later for lunch. Service was great, despite a very full crowd from NHC and a soccer game that was goin on. Had a tasty pint of a chocolate stout with a very nicely done burger.